The premise of his book is that God is a God of grace. The covenant of grace is the bedrock of parenting. We parent based on the covenant. He doesn’t want to presume regeneration, nor does he want to ignore the covenantal promises. He argues that if we refuse to say to our children that they need to repent and believe, then we will create little Pharisees. After laying the covenantal foundation of parenting, he gets into the how, which is written under the rubric of prophetic, priestly, and kingly tasks. Finally, he looks at some of the major problems. In this address, he wants to focus on four areas. These foundational covenantal truths are the first issue. Parents need to believe that the covenantal structure of the promises is the reason why we will believe in God’s grace. The only perfect parents are those who don’t have kids yet. We should bring up our children “seamlessly,” which means that all the major influences will work together to bring up our children in the nurture of the Lord. Secondly, we should use this rubric of prophet, priest, and king in the home. Of course, these offices have an echo in our lives in general. However, it is also true in our parenting. The prophetic task means that we should seek out opportunities for teaching. Family worship is vitally important to this. As priests, we are to be intercessors for our children. We should pray for them in our family worship. As kings, we have to fight against Satan and sin in this life. As parents, we help our children to discern God’s will. We discipline them, and guide them in their spiritual and temporal lives. The third thing is that we must ourselves be models for living out the Gospel. Proper child-rearing is as much caught as taught. We have got to live what we teach them. A parent has to be a transcript of their teaching. We must love our children as Christ loves us. We should never fail to let our children know that we love them. We should not be shocked when our children sin. We sin, after all. We must ourselves grow in sanctification. The Gospel must inform and shape the way we deal with problems in the home. None of our children will ever treat us half as badly as we have treated our Lord Jesus Christ. We should therefore make sure that our interaction with our children should be largely positive. Fourthly, we must recognize the times and seasons of the Christian life. How can we teach our children about the changes that will come into their lives before those changes occur? 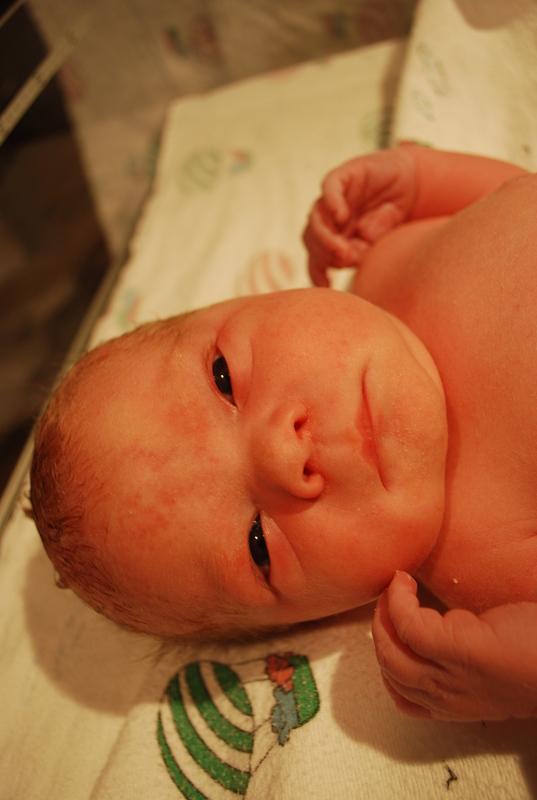 Born at 6:23 PM, weighing 8lb 1oz, 20 1/2 inches. Mother and baby are both doing well so far. I was able to use my Nikon to take pics of old photos. They turned out rather well, and made them so much easier to manipulate. My grandfather was a great man. He was born July 11, 1914, and died January 4, 2010, at the age of 95. He worked for GE for 41 years. He was an electrical engineer, and was on the ground floor in the development of transistors (TV in its infancy), radar (particularly counter-radar, instrumental in the Normandy invasion), and the Apollo space projects. He was quite literally a rocket scientist, among many other things. He could make wooden grandfather clocks, making his own jig for each spoke of the gears inside. He turned wood on his lathe, and could fix most electrical or mechanical problems with things. Grandpa was a very kind man, as well. He was absolutely devoted to his wife, Ila, who is now 97. He took very seriously the statement in Proverbs 13:22 that a wise man provides an inheritance for his children’s children, something for which I will personally be very thankful. The evidence points strongly in the direction of his being a believer in Jesus Christ as Lord and Savior. Two stories I would like to share that illustrate his character. Firstly, we were putting insulation in my parents’ garage. I was probably about 15 years old at the time. The insulation was for the ceiling. Since the roof slanted down, we had to chamfer the edges. That’s what he said we had to do. I didn’t know what the word “chamfer” meant, so I asked him. He said, with an absolutely straight face, “It’s REALLY scientific.” He then proceeded to tear away the insulation at quite a rapid rate with his hand in an anything BUT scientific fashion. Secondly, when we were living in Texas, Grandpa and Gram came for a visit. We had this puzzle that was a sphere with lines of beads on it. Grandpa was entirely engrossed in seeking the solution to this puzzle. He was sitting on our couch in the living room. Gram had found our tricycle, in the meanwhile. This tricycle is unique, in that it has a storage platform behind the seat. This actually allows an adult to sit on the storage platform and pedal one’s way around quite happily. Of course, when Gram started wheeling around on our linoleum, we were absolutely cracking up. Here is Gram, in her seventies at the time, and about 5 feet tall (or short!) pedaling around in this tricycle on our linoleum floor. Our living room, however, was carpeted. So, when Gram decided to into the living room, she found it much more difficult to pedal her way around. Grandpa, of course, was completely oblivious to all the laughter, being utterly engrossed in this puzzle. Then Gram actually ran over Grandpa’s foot with the tricycle! Did Grandpa notice? Of course not. He was too engrossed in this puzzle. However, we thought of a way to distract Grandpa from his puzzle. Mom made coffee, and said, in quite an ordinary, or even softer than normal voice, “Coffee’s ready.” Grandpa immediately jumped up and said, “Coffee?” Grandpa was, perhaps, the original engineer, with the ability to block out all other issues, and focus with blinding single-mindedness, on this single issue. There was no gradation in importance of simultaneous projects with Grandpa. It was all or nothing. I shall miss him greatly.I had the honor of preaching the funeral sermon at the service. I have posted it below. God doesn’t have grandchildren. What do we mean by that? It means that no one can see God by being a child of a believer, or a grandchild of a believer. One must be an immediate child of God. For us humans, of course, there are many things that can pass down from one generation to another. Grandpa was very interested in these kinds of things. Hence his abiding interest in genealogy, and his abiding interest in this verse of Proverbs. I am sure that every one of his children and grandchildren will always be grateful that Grandpa thought it the better part of wisdom to save money for his children and grandchildren. I know I will be. What I’d like for us to do is to compare human fathers and grandfathers with our Heavenly Father, and the relationships that go along with that. This will not be to put Grandpa down, but rather to use our relationship with Grandpa to help us think about our relationship with God. To do that, we need to remember our history, seeing the problems with humanity, and then think about the solution. We read from Genesis 3. That story tells us how humanity fell into sin. Adam was the son of God. Luke tells us that in his genealogy of Jesus. Adam was made in the likeness of God, in the image of God. When Adam and Eve fell into sin, that image was distorted. The relationship changed. Adam and Eve were disinherited. God disowned them in judgment. He pronounced judgment on them. But notice God’s grace even in the midst of judgment. For He did not execute them immediately. Yes, their souls were dead, but God made a promise to them, and as soon as Adam and Eve believed that promise, they were resurrected in their souls to eternal life. We can call this promise the beginning of the Gospel promise. A seed born from the woman would crush the serpent’s head, while being stricken in the heel in the process. Notice that this promise has to do with someone born of the line of Adam and Eve. This is crucial, since Adam was the head of the human race. There needed to be a new head of the human race who could fix what Adam broke. And he would come from the genealogy of Adam and Eve. The Bible is just as interested in genealogy as Grandpa was. Genesis 5 has a genealogy in it that is very interesting, because the chorus is “and he died, and he died, and he died.” But Enoch, the seventh from Adam, does not die. There is a clue there that death is not the end of the story for humanity. All through the Old Testament, believers had faith in the promises of God that God would eventually provide the answer to sin and death. The chosen line was in danger countless times throughout the OT, but yet God always kept that seed alive. Abraham believed that God could raise his son from the dead, and that is why Abraham could do what God asked of him. As Hebrews says, figuratively speaking, Abraham did receive his son back from the dead. Job believed that his Redeemer lived, and that he, Job himself, would see this Redeemer with his own eyes. David also knew that his God would not leave his soul in hell, but would raise him from the dust of death to new life. Ezekiel was shown a valley of dry bones. He didn’t know if those bones could live, but he knew that God knew, and he also knew that if those bones could live, it would be because God would make them alive. And that is exactly what happened. In the New Testament, we see that God kept His promise, made all the way back in Genesis 3. Jesus is the seed of the woman come to crush the head of the serpent. In the process, the serpent struck His heel, actually killing Him. But why did Jesus come to die? Why was it necessary? Well, God doesn’t play favorites. God is just, even though He is also merciful. All humanity was under condemnation. Paul says this over and over in Romans 1-3. Actually, strict justice would have required God to punish Adam immediately. The only reason God didn’t do that was because of the promise that Jesus would eventually come. That promise is reason why there is any history at all. God could have snuffed out Adam’s life immediately after the sin. But God did not do that, because He is also merciful. But how can God be merciful and just at the same time? Sin has to be punished. As Proverbs also says, cursed is a judge who judges a guilty person as if he was innocent. That is a travesty of justice. So how can God judge sinners to be innocent? Only if there is a Mediator to come in between God and man to take the punishment upon Himself. Jesus comes in between the wrath of God and sinful humanity, and takes the guilt upon Himself. So sin is punished in the person and work of Jesus Christ, while those who believe that Jesus did that for them will receive the pronouncement of innocence. But we might still ask how this can happen. It happens through imputation. Imputation is a long word that simply means that God reckons something as having happened, when it didn’t actually happen. We use this kind of idea all the time, actually. If two people are at a restaurant and they are supposed to go Dutch, but one of them accidentally forgot his wallet at home, the other person can pay the bill, and it is as if both had gone Dutch, even though that isn’t what happened. In the case of sin, our sin and guilt is reckoned as if Jesus had done it, even though he hadn’t done anything wrong. And then what Christ did throughout His life, which amounted to perfect obedience, is reckoned to the believer, as if the believer had done it, even though the believer has done nothing of the sort. So, our guilt is reckoned to Christ, and His righteousness is reckoned to us. This is usually referred to as double imputation. If this double imputation is how we are reckoned to be innocent, then why can that happen? It happens because when we trust in Jesus Christ, we are united to Him in faith. It is a marriage of our souls to God. Just as (at least the average) marriage means that whatever debt might have been owed by one spouse now becomes the debt of the other, and whatever assets the one spouse had before marriage usually become the assets of both of them after marriage. When we become united to Christ, we become married to Christ. He is the bridegroom, and all believers are part of the bride of Christ. He takes on the debt of our sin, while giving to us all the assets of His righteousness. This marvelous exchange, by the way, is called justification by faith alone. This whole coming to faith thing is described in the Bible as being born again, in John 3. After all, if we are going to be God’s children, we have to be born into that relationship. This is why God doesn’t have grandchildren. We need to be born of water and of the spirit, as Jesus tells us in John. This new birth is elsewhere called the resurrection of the soul. The resurrected soul can never die. The death of a loved one should make us think about our own deaths. We are mortal. The real question is this: will we die two deaths, or only one? For those who trust in Christ, their bodies will die, but their souls will remain alive forevermore. And we also have the promise of the new heavens and the new earth, where we will have new bodies that will never die again. So the believer has only one death, and two resurrections. For his soul is resurrected in this life, and his body will be resurrected on the last day. Unbelievers have just the reverse. Their souls are already eternally dead. Their bodies will die. At the last day, their bodies will be resurrected, but only to eternal condemnation. If this sounds harsh, we must remember that it only sounds harsh if we assume that there is nothing wrong with humanity. But if we believe what the Bible says, that all humanity is in rebellion against God, then eternal condemnation is only pure justice. God is not a homicidal maniac. So the question for all of us is this: do we believe in Jesus Christ, or not? Is he Lord and Savior of our lives? If He is, then we have eternal hope and comfort. Grandpa was asked before he died whether he believed in Jesus Christ as Lord and Savior or not. He said that he did. We therefore have high hopes that we will see him again, if we also trust in Jesus. For then, we with Grandpa will experience the resurrection to eternal life. If that is so, then this is a separation only for a season, and not a permanent situation. And this is of enormous comfort to those of us whom Grandpa has left behind. Yes, it is true to say that Grandpa is in a better place. That’s wonderful for him. But it is not the most comforting thing for us who are left behind. The most comforting thing to know is that all of us who believe in Jesus will be reunited with him once again. We will see Grandpa again, talk to him again, hug him again, touch him again. That very physical ache that we all have of missing him will be no more one day. For God will wipe away every tear from our eyes, and sorrow will be no more. It is also helpful to say a word about grief at this point. It is never very helpful to deny grief, or seek to bury it deep down. Grief has a way of making itself felt no matter what we might try to do to stifle it. The way is always straight through grief, never around it, or away from it. Remember what Paul said in 1 Thessalonians to those who were grieving. We grieve, yes. Jesus Himself wept at the death of his friend Lazarus, and He was just going to raise Lazarus from the dead, and He still wept! Death is not a natural thing in this world. Death only came into this world through sin. Death is therefore an intruder, and it is right to grieve over all the effects of death in the world. Death is not the way things are supposed to be. But our grief is a tempered grief. It is lined with the comfort of the resurrection, which is not only God’s answer to death, but it is also God’s answer to the problem of evil in this world. It is full of the hope of the new heavens and the new earth. And so our grief is not like that of the unbeliever, who has no hope. If there is one thing that Grandpa would like to say to us right now, it is this: turn your life over to Jesus Christ. He is the way, the truth, and the life, and no one comes to the Father, except through Him. Grandpa would have loved to give us all faith and eternal life. But Grandpa can’t do that. As capable as he was of doing so many things in life, he cannot give us faith. Only our heavenly Father can give us that. Grandpa gave us a good physical inheritance. God gives us the eternal inheritance of the new heavens and the new earth. Grandpa was wise. God is all-wise. And, unlike Grandpa, God only has children, not grandchildren. Won’t you be one of His children today? Sarah and I had a sonogram today, and there was no heartbeat at all, and the development was three weeks behind the 20 1/2 week mark. We will have to go in tomorrow to have Sarah induced. Please pray that it may be quicker than I think it will take (it could take as long as 24 hours or as short as 5-6). We know that we now have one child safely in the arms of our Heavenly Father now, and we have the Gileadic balm of the hope of the resurrection. We will go this little one, even if this little one will not return to us. Please pray for us. The Rev. Voddie Baucham is becoming more and more well-known. He has several videos on Youtube, one of which has to do with Sarah Palin and family values, and another one is a discussion about theodicy. He is becoming the African-American John Piper. Now he has written a book (not his first book) about young men and marriage. This is certainly an issue that cries out for our attention, for how many real men are there out there? How can we raise godly young men? How can we find godly young men for our daughters to marry? Voddie has some excellent ideas on this. I think what I appreciate most about this book is its balance. On the one hand, there are very high ideals. On the other hand, there is grace. There isn’t just a list of things he must be if he is to marry my daughter, and then no thoughts on how to achieve that. It is not just a checklist that makes it all but impossible for any men to fit the bill. The last chapter is indicative of this concern: “Can’t Find One…Build One.” There is a very healthy recognition that no man is going to have all these things down pat before marriage. And yet, this does not diminish anything from the high standards that should be set. Another balance that Voddie achieves well is on the issue of method. There are lots of conservatives out there who think that the bride can be obtained if the method is all in place. Voddie sees the problems with, say, dating, but does not go over to the other extreme of arranged marriages. He argues that the parents should be involved in helping the daughter to find an appropriate mate. There are very good reasons for this, the most important being that a young woman seldom has the ability to see red flags to the same extent that the parents can. It is hard for her to evaluate objectively. Yet another fine balance he achieves is that of the criteria for evaluation. We’re not looking merely for a good leader, or a good Christian, or something else, but a conglomerate. Fathers should therefore be very concerned about the doctrine that a potential son-in-law holds. I have only one very small criticism of the book. In the last part of the book, Voddie has an admirable discussion about racism, about which I completely agree. However, I think it might also have been helpful to point out that inter-racial marriages will have some extra cultural issues to work out that an intra-racial marriage would not have. It is certainly no bar to inter-racial marriage, but it is a concern. There are cultural differences between black people and white people (and also among all other cultural groups). And while those differences are no bar to marriage, they should be addressed so that potential mates are on the same page. I intend to have my daughter(s) read this book as well as my sons. I think it is a very helpful book that addresses a very real need in the church today. And, unlike many books, we are not merely shown the problem, but also how to fix it. Voddie is an extremely clear communicator with lots of helpful to-the-point illustrations. It is an easy book, but by no means a shallow book. May it have a wide audience.